I returned from a trip that included shooting in Southern Nevada and in the Grand Canyon. Although the Grand Canyon was spectacular, I didn't get many good photos--Haze was hideous always, and sunrise and sunset were completely socked in by clouds 3 of the 4 times I saw it! On the other hand, in Nevada I got some photos I was very pleased with. 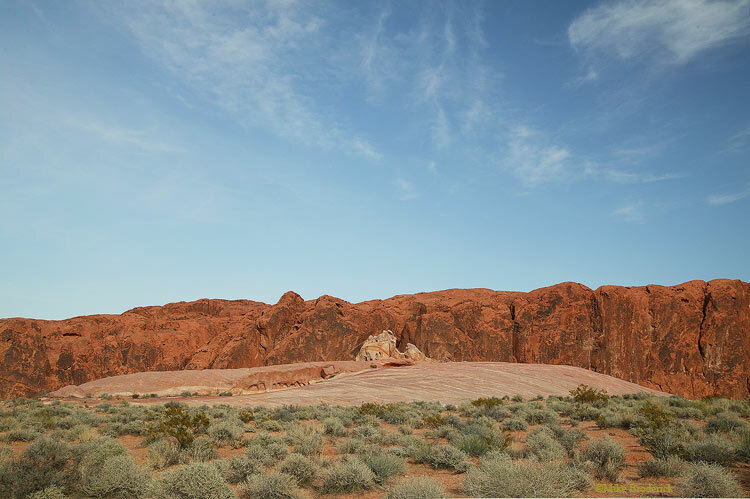 The wind and especially water have produced some amazing eroded rocks in the desert. This one reminded me of a submarine. The US Navy considers most submarines as boats rather than ships, else I'd have to make a joke about "Ship of the Desert" (sorry Ken!). 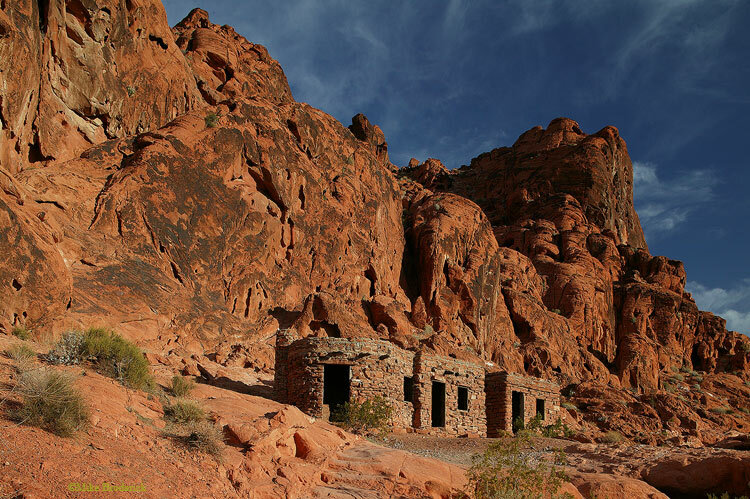 These stone cabins look like something from the pre-Columbian era, or at least the Spanish colonial era, but they were actually built by WPA workers in the 1930s! They're very well-integrated into their spectacular environment. I acquired a fascination for curving highway shots taken in interesting surroundings during this trip. This one was probably my best, taken with my 16-35mm lens zoomed as wide as it would go. I also took several shots at a more sane focal length for stitching later. But the wide-angle effect gives this one a sort of cool factor. This one was cropped heavily to get the ratio, and contrast was enhanced a lot to punch up the boring sky. Nellis Air Force Base is in this area, and the US Air Force is constantly holding exercises. 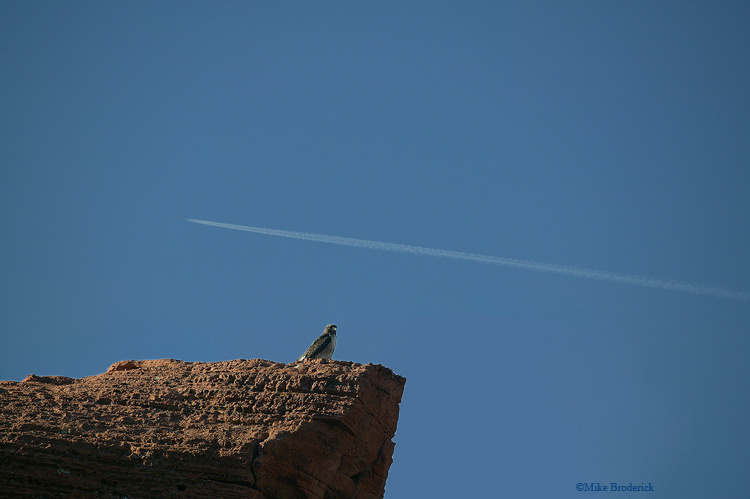 When I saw this bird of prey perched on a rock with a jet contrail behind him, I envisioned a shot showing two mighty predators of the air, but viewing the shot at 100% indicates it is "just" a peaceful airliner zipping through the sky. This is a merging of two shots for DOF reasons, but it does reflect faithfully what I saw. I did get some decent closeups of petroglyphs (of which there are lots in the area and I took a fair number of lizard shots, though I seemed to be under a curse on my lizard shots, there were problems with nearly all of them this trip! I have often wondered why, Mike, that the US Navy referes to submarines as "boats." I am quite sure that there is a really good reason for the nomenclature now being used, which brings to mind an old saying I have heard oh so often, "there is my way, your way, and the NAVYS way." You can guess who's way wins out. Beautiful shots here Mike. I have spent quite a large amount of time in Nevada, at NAS Fallon, where my old squadron (VF-51, the Screaming Eagles) would go for bombing excercises/training. We flew F-4 Phantoms back then and it was often said that the F-4 is proof, that if you put J79 engines on a rock, it will fly! The state of Nevada is quite beautiful I found out though and interesting things just seem to pop up out of nowhere at times.